This entry was posted on October 3, 2013, in NME. Bookmark the permalink. It is dangerous to be right in matters where the established authorities are wrong. Voltaire said that. It is dangerous to be a politically radical multi-racial punk band when the law itself is openly racist. National Wake were that band. 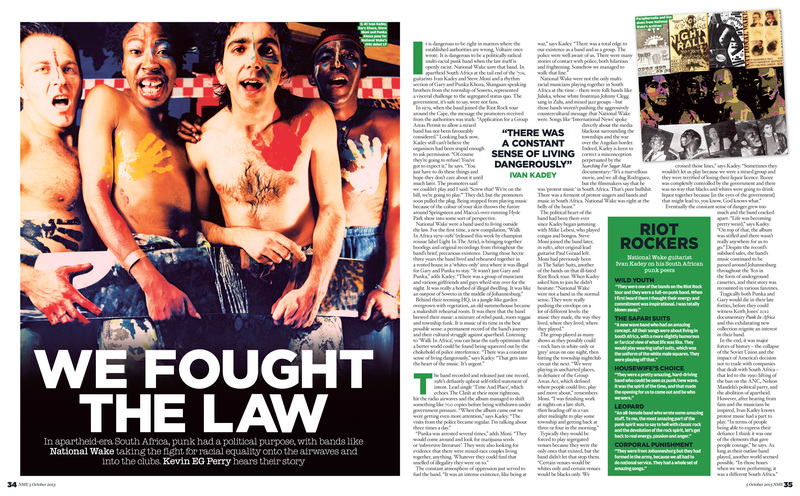 In apartheid South Africa at the tail end of the Seventies, guitarists Ivan Kadey and Steve Moni and a rhythm section of Gary and Punka Khoza, Shangaan-speaking brothers from the township of Soweto, represented a visceral challenge to the segregated status quo. The government, it’s safe to say, were not fans. In 1979, when the band joined the Riot Rock tour around the Cape, the message the promoters received from the authorities was stark: “Application for a Group Areas Permit to allow a mixed band has not been favourably considered.” Looking back now, Kadey still can’t believe the organisers had been stupid enough to ask permission. “Of course they’re going to refuse! You’ve got to expect it,” he says. “You just have to do these things and hope they don’t care about it until much later. The promoters said we couldn’t play and I said: ‘Screw that! We’re on the bill, we’re going to play.’” They did, but the promoters soon pulled the plug. Being stopped from playing music because of the colour of your skin throws Macca and Springsteen’s over-running Hyde Park show into some sort of perspective. Eventually this pressure grew too much and the band cracked apart. “Life was becoming pretty weird,” says Kadey. “On top of that, the album was stifled and there wasn’t really anywhere for us to go.” Despite the record’s subdued sales, the band’s music continued to be passed around Johannesburg throughout the Eighties in the form of underground cassettes, and their story was recanted in various fanzines. Tragically both Punka and Gary would die in their late forties, before they could witness Keith Jones’ 2012 documentary ‘Punk In Africa’ reignite an interest in their band’s music. For the first time, bootleg and original recordings from throughout the band’s brief life have been collected together for a new compilation, ‘Walk In Africa 1979-1981’. Originally published in NME, 5 October 2013.